Nurture envisions communities working in collaborative ways to enhance nutrition and wellness of children and families. Nurture partners with other organizations and individuals in a fun, hands-on way with the goal promoting healthy life-long habits. Our programs have often been described as "nutrition education disguised as cooking classes". Since our launch in 2008, Nurture has been part of the incredible momentum around nutrition and wellness education in schools. We are thrilled with the fantastic curriculum and materials that have been developed by myriad organizations getting involved; notably Let's Move!, The Alliance for a Healthier Generation and celebrity initiatives such as Jamie Oliver's Food Revolution and Alice Water's Edible Schoolyard. It takes a lot of work to get programs organized and implemented in the school setting. Nurture hopes that you find the way we've outlined our resources (Recipes and Curricula) on the website to be helpful in implementing programs in your own local community. And while we have utilized a fantastic set of experts including MDs, PhDs, Registered Dietitians, and fitness pros in creating our own curricula, we do not take the approach that "our program/curriculum is best". We love teaching and sharing our curricula/intellectual property, but we we also love the materials that are being produced by other organizations. We are all part of this incredible movement together, working together! We at Nurture know that while kids are key influencers in choosing foods, the caregiver is the gatekeeper to foods and habits in the home. We have a unique approach to overcoming the obstacles to eating well that we hear in our work with social service agencies and food pantries. Our Recipe Frameworks (c) (developed by Nurture and now used by Cooking Matters to teach hundreds of thousands of individuals each year) allow for maximum customization of recipes as well as a time and money saving approach. We also focus on highly economical food groups (whole grains, beans, split peas, lentils and fruits and veggies) to provide maximum nutrition and taste for the food dollars spent. 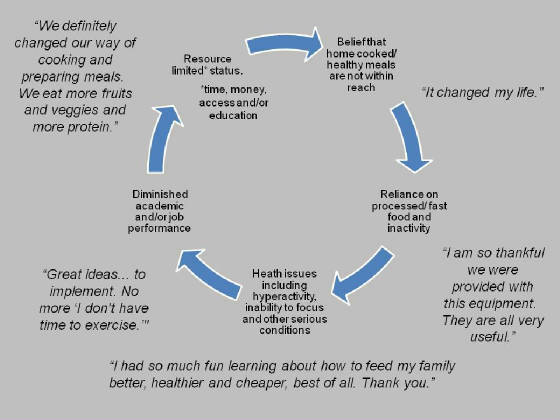 The following diagram shows how the Nurture program can "break the vicious cycle".